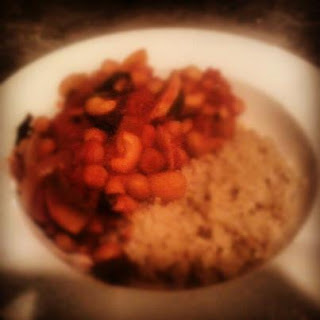 Indulge Nourish Sustain: Chickpea & Cashew Tagine.. Middle Eastern Goodness! Chickpea & Cashew Tagine.. Middle Eastern Goodness! This is a recipe I whipped up one evening thinking it wasn't going to be anything special, just another chickpea casserole... but what a delicious surprise! The Cashews & Brown Rice in this recipe really add to the nuttiness of the Tagine, bringing out the flavour of the cashews and complimenting the cinnamon spice. Its a cheap and easy meal to throw together but is rather impressive! I found it didn't taste quite as good the next day - the Cashews had gone soft and didn't have as strong a flavour. So make it fresh, serve it to guests and enjoy a delicious, guilt-free meal! Heat Olive Oil in a large pan. Add chopped Vegetables and drained & rinsed Chickpeas. Saute for 3 minutes until vegetables are cooked. Sprinkle Cinnamon through vegetables and pour in cans of Chopped Tomatoes. Stir 1 Tablespoon Lemon Juice through and add Coriander and Cashews. Simmer for 5 minutes. Serve on a bed of Brown Rice... Simple!